Just hours after Apple launched sales of its newest iMac, an unboxing video and teardown photos hit the web detailing the sleek new all-in-one from its "trapezoidal" packaging down to its Intel i5 CPU. 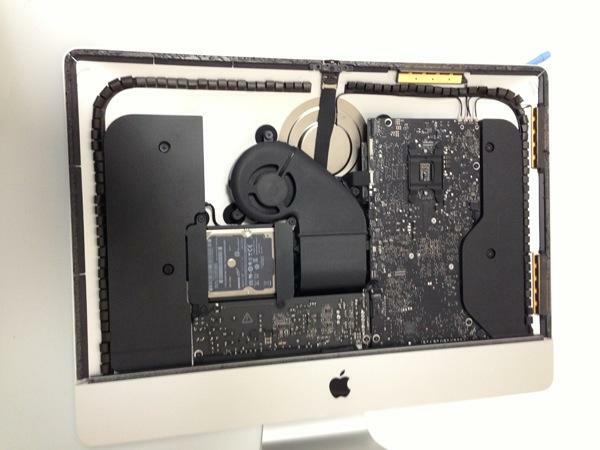 Update: AppleInsider reader Ben has shared an unboxing video of his new iMac below. The pictures, from Japanese Apple blog Kodawarisan, are some of first to offer a peek (machine translation) inside the revamped 21.5-inch iMac, which at its thinnest edge is only 5 millimeters thick. Beneath the monolithic black display is a spartan interior that is hardly cramped for space as the logic board and accompanying circuitry are neatly arranged toward the middle of the chassis. All integral silicon is sealed off from the environment with a flexible rubber gasket system, save for a single opening for the FaceTime HD camera's ribbon cable. 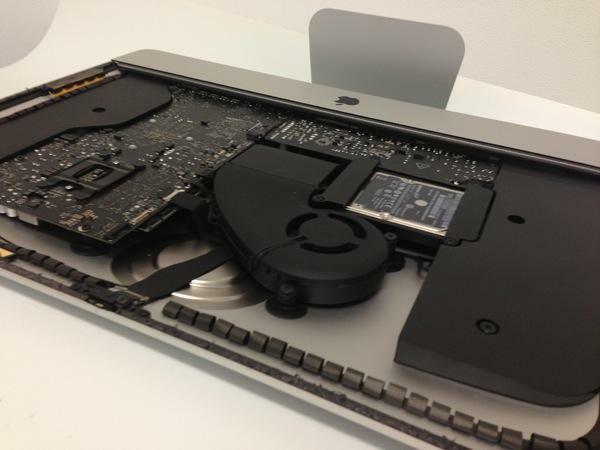 The iMac shown in the photos is the high-end version with a quad-core Intel Core i5 processor running at 2.9GHz. 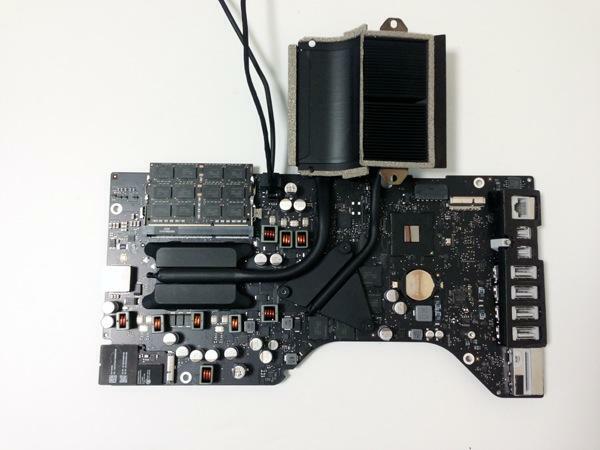 A closer look at the logic board itself shows fairly large thermal transfer system that channels heat to a single centralized cooling fan located directly above the hard drive. Heat management looks to be well taken care of with a network of ducts funneling air to all corners of the chassis. Apple started rolling out the slimmed-down iMac on Friday starting with Australia, and U.S. Apple Stores are expected to open their doors with limited stock of the 21.5-inch model in a few hours.